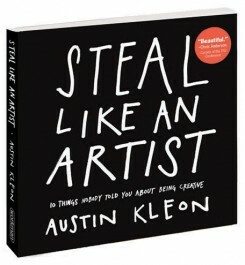 Book review week and today, it’s Steal Like an Artist by Austin Kleon. This is a great book. It’s small, a quick read and loaded with pithy advice, exercises, and words of wisdom on everything from “stealing art” to dealing with other artist’s who drive you nuts. This is the perfect follow-up book to “The Artist’s Way” in that it tells you what to do to keep that creative spark alive and to live the life of an artist.